Start this discussion by getting one major question out of the way. What’s the best kayak paddle? There are several great choices, but the accurate answer would be this: The best kayak paddle is the one you’re most comfortable with; the one you enjoy using to glide across the surface of the water. Beyond that, you might use price as a determining factor, though this can be misleading at times. It’s also essential to keep in mind, having the right paddle for you will make all the difference in your comfort and in the amount of energy you will use moving across the water. Choosing paddles is not all that difficult, if you have some of the basics in hand: shape, length, materials used. To make your choice, focus on length first, according to your height, how you paddle and kayak width. If you’re more than 6 feet tall, you certainly won’t be comfortable with the same paddle used by someone who is 12 inches shorter. That smaller individual would find a long paddle more than uncomfortable. When a paddle is much too long or much too short, the journey is not enjoyable. It’s exhausting. 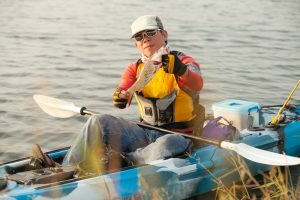 While every individual has his or her own style and position when in a kayak, for purposes of this discussion you can divide paddling style into low-angle and high-angle. The first style is more relaxed with the blade touching the water in slower strokes. Generally, someone who is using low-angle paddling will have a paddle with slimmer blades. The length might also be a bit longer than the paddle used by somewhat with a more-aggressive, high-angle style. The repetition of the stroke is faster and is more likely used to manoeuvre and to speed up. This type of paddling will require more energy and will certainly help build stamina and strength where it didn’t exist before. Remember, you may use both of these styles, depending on conditions. The other key factors to consider are your height and the width of your kayak. Paddle lengths generally run from 200cm to 250 cm (approx. 6.5 feet to 8 feet). 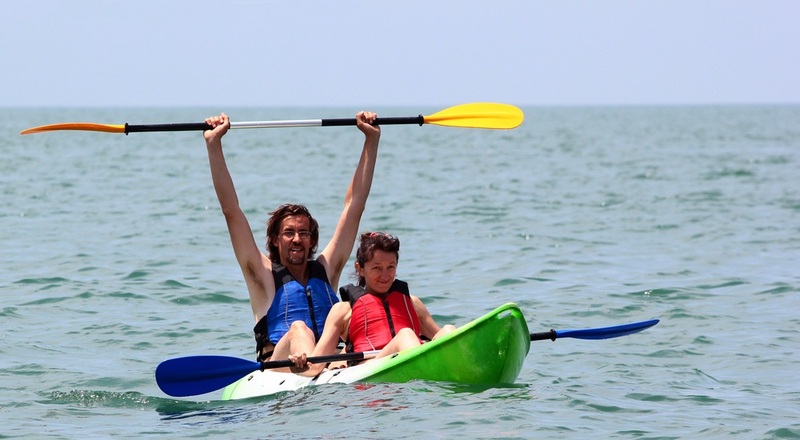 Taller individuals will use a longer paddle for low-angle paddling, if the kayak is just a bit more than two feet wide. In the same kayak, a person of about 5 feet in height should have a paddle that’s about four inches shorter. These are only general guidelines, of course, but they can get you started if you’re a true beginner. Make adjustments for smaller boats (under 23 inches wide) and for larger kayaks, 30 inches to 32 inches wide. When you have an idea about the general size of your kayaking paddle, it’s time to look at some other details. The first step is to learn more about materials used to make quality paddles in the 21st century. In ages past, it was necessary to use heavy wood to move your canoe about, and some people even used single paddles made of wood when they were on a leisurely kayak trip across smooth water. However, with improved technology it’s now possible to buy a strong-but-lightweight kayak paddle, which makes paddling and manoeuvring much, much easier. It’s important to find equipment that is light but very durable, with emphasis on keeping weight low so you don’t wear out too soon on long journeys. As you shop for paddles you’ll find a few main “ingredients” used to manufacture good paddles. 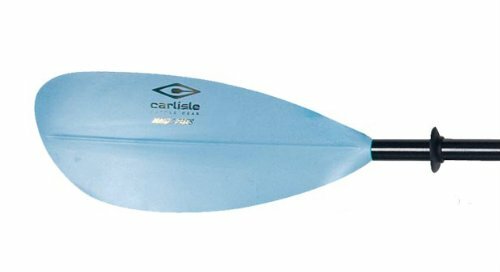 Fibreglass paddles are fine for recreation, and will bring you in at the middle of the price range. These are light in weight and last a long time. In addition, you’ll probably be able to find one in your favourite colour. Carbon fibre paddles are also light in weight but this material will make your choice a bit more expensive. But, the material is very strong and allows you to get a paddle that’s even lighter than fibreglass. You’ll probably find a paddle made from an aluminium/plastic combination most affordable. While they’re a good choice if you’re just starting out, they can be a bit heavy for smaller kayakers. You should also allow for the cold feeling of the metal if you head out when it’s cold outside. You’re not finished with the custom choices on your paddle, because you need to decide if a feathered blade is right for you, or if you should try the non-feathered style. This is extremely important, because the feathered blades are offset, while the non-feathered blades are in line. There are several benefits to using a feathered blade. If you choose this design, you’ll meet with less resistance from the wind as you move the paddle above the water. You’ll also experience less fatigue in the lower arms and the wrists. Make one more decision when choosing this type of paddle: angle. Options range from 30 degrees to 45 degrees. You’ll be more efficient with the greater angle, while you’ll use less energy with the smaller angle. You’ll also need to consider which is the “control” hand, though you can buy paddles that can be taken apart for changes in angle and control. The control designation is not automatically determined by your dominant hand. You should also give plenty of thought to the shape of the blade as well as to the type of shaft you’ll use. A straight shaft is fine, though some kayakers prefer a shaft that is slightly “bent” to place your hands more comfortably. It’s also important to decide if a simple, round shaft is right for you or if you are more comfortable with an oval shape. Where should you start when you have made your notes from this lengthy introduction? Look at some of the top kayak paddles from reliable manufacturers and get the best price you can find. Simple, right? Wait until you go through the list and see what you think. This is a good choice for touring kayakers. Like most of the top products, it’s light but durable, with a fiberglass shaft and blades combining glass fibers and strong plastic (polypropylene). Your options include orange and blue colors, three lengths and two-piece construction for easier portability. This paddle will stand up to obstacles, rocks etc. These well-designed, aluminum-shaft paddles will be a great choice for the beginner. You can adjust the offset angles and also benefit from comfortable grips. The shafts have drip rings to prevent water from running to your hands. If you insist on a paddle made in the USA, this should be our choice. It will serve you well from the beginning and for the long-term. This top-rated paddle will probably get some votes for the best name. Bending Branches is one of the older companies in the field, with roots in the early 1980s. The company first made canoe paddles from composite materials and moved on to make kayak paddles as well (still in Wisconsin). Key parts are the fibreglass shaft and nylon blades, adjustable from 0 degrees to 60 degrees. You can even choose the upgrade which allows you to use the paddle with different kayaks and different users. Fishermen using this paddle will appreciate the hook-retrieval and measuring marks on the shaft. Move up one level with the Angler Pro. As you shop for paddles among these great options, you’ll find the SeaSense is less expensive than others. 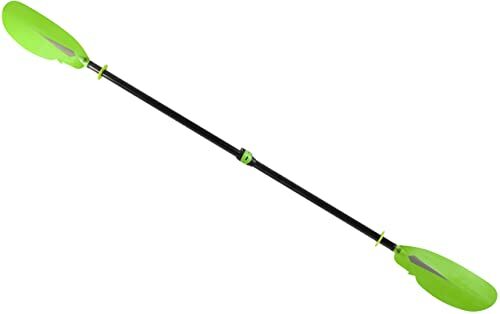 But it still delivers outstanding service with a two-piece aluminium shaft and durable plastic blades. 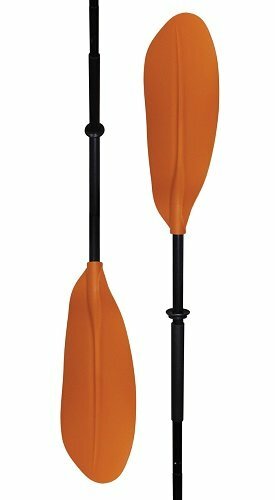 Foam grips makes this paddle comfortable for longer trips. Other useful features are drip guards of rubber and adjustable blade positions. This popular, reasonably priced paddle uses aluminium construction and durable molded blades for distance travel with reduced fatigue. 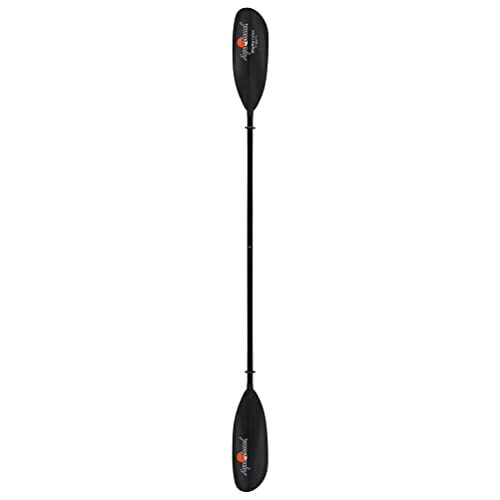 Secure pieces with the toggle button on either an 84-inch paddle or a 96-inch paddle. Good beginner or spare choice available in orange or blue. A lightweight paddle with aircraft-grade aluminum shaft and nylon blades (fibreglass reinforced). Great portability with four sections that reduce to 25 inches. Asymmetrical blades are right for low-angle paddling. Available only in one size (231cm), which will be fine except for the wider kayaks. A good choice for those who focus on transporting gear as a key factor. When you know, for sure, that you need a great touring paddle, you may want to go with the Aqua-Bound Sting Ray. Extremely light, which makes it an excellent choice for smaller, younger individuals. Carbon fiber shaft and nylon-resin blades will provide long-term service. It’s best used in slow streams or lakes. The Sting Ray is available in five lengths, ranging from 210cm to 250cm, with two-piece design. A four-piece model is also available for an additional cost. This is definitely a “higher end” paddle with carbon-fiber shaft and light weight. 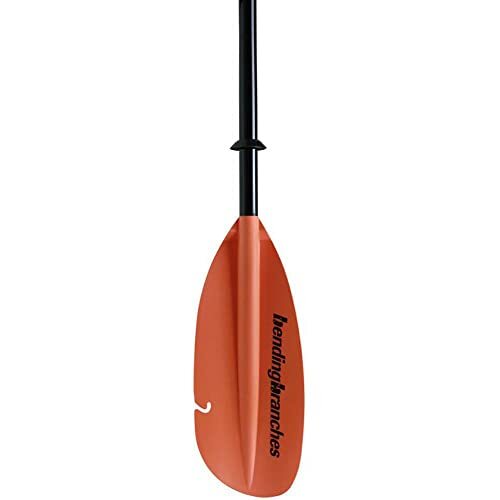 In spite of its weight, this paddle will stand up to hard use, with glass/nylon blades and has the additional features that make it ideal for fishing from your kayak (retrieve overboard items, grab line etc.) Adjust your blade angle with cam-lock design. Stay safe with the high-visibility green blades. Prices vary widely on this list, for a reason. 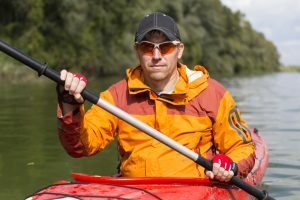 You can select from one of the more expensive paddles when price is not your major buying factor, or, you can select a less expensive paddle if you’re a beginner, need a good spare, or your outings are primarily on smooth lakes and slow-moving streams. For example, you may want to choose the Seattle Sports or the Bending Branches product for the best “working” paddle for fishermen. 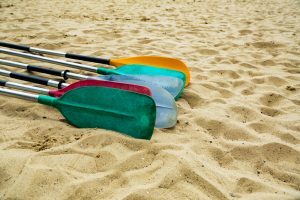 Shoreline, on the other hand, makes an inexpensive paddle that can be a good choice for those just starting out and for people who are occasional, recreational kayakers. 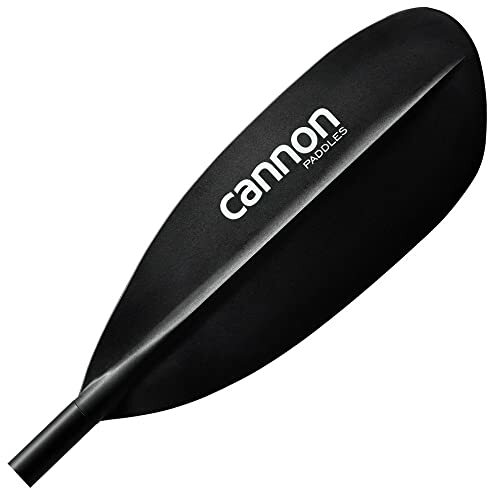 Cannon and SeaSense make reasonably priced paddles to attract individuals new to the sport, though these can also be fine for recreational trips. Try Aqua-Bound or Carlisle for the best choice in touring paddles. Not only is it very, very light, it’s also available in five lengths. When you look closely at Advanced Elements paddles, you’ll see portability. This is your best choice when transporting gear is a major concern. With every paddle listed you’ll find some great features and some outstanding benefits, including attractive prices on one or two products. But the key factors should always be finding a paddle that fits you, your paddling style and the conditions you’ll be traveling in. You forgot to include Greenland Paddles.